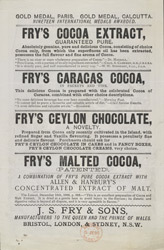 J. S. Fry & Sons is the oldest chocolate firm in Britain. Joseph Fry was a Quaker who trained as a doctor in the 1700s. He became convinced of the health giving properties of cocoa and started making chocolate in his apothecary shop in Bristol. The business was eventually taken over by son, Joseph Storrs Fry. He created J. S. Fry and Sons and by 1907 the firm had 10 factories employing about 4,500 workers.